The ‚P‘ word: it’s scary. The ‚P‘ word: protect your loved ones. It’s at the gates. It’s on TV. It’s not what you think it is. It’s populism. Populism has been something of a catch-all term to explain the changes in global politics. It is a somewhat problematic term since it does not distinguish between ‚good‘ forms of populism and ‚bad‘. The word populism implies that there is a ‚higher‘ form of politics (which suggests that grass-roots participation in politics is somehow flawed), and it lumps together political causes from the entire political spectrum into one entity. In other words, it is a technocratic term: something to describe people getting in the way of the experts and managers of public policy. Nevertheless, it is a serious issue. Populism could indeed encompass political policies that are appealing to and hearing the concerns of ordinary people, while it could also mean politics playing to the lowest-common-denominator in public life and exploiting public fears. Both seem to me to be undoubtedly true. On the one hand, we have the rise of grass-roots movements which seek to build on real, ordinary, public concerns such as Podemos in Spain and (to an extent) Syriza in Greece. And then of course, on the other hand, there is the extremist, often violent, hate-filled politics of Steve Bannon, the AfD, Front National, Narendra Modi and others around the world. The latter form of politics seems to be having a moment. And it is frightening. However, this divisive branch of politics also seems to have a very strange kind of life-cycle. It thrives on hate and on ‚moments of euphoria‘. For example, it hates foreigners and thrives on a specific circumstance, such as a law being passed to allow the free use of hate-speech. A euphoric, violent moment. But then where does such a political impulse go? Well, it only has one route: even more hate. History tells us where this route leads and it’s not pretty, but at least along the way, this form of populism loses all pretence of representing a real social concern. Take UKIP, for example, the British anti-EU, anti-establishment party. For years it has campaigned against the EU, and experienced its zenith of political achievement in the Brexit vote of 2016. However, since then, it seems to have lost its raison d’etre. It has no other policy, no other programme but to divide communities with hate speech and xenophobic ideology – it simply existed to get the U.K. out of the EU, and having achieved that, the party has lost all of its momenta. So where did it go? Well, into the hate-filled regions of the dark side: open, clear, undisguised Islamophobia. Its leader Gerard Batten recently appointed Stephen Yaxley-Lennon (aka Tommy Robinson) as a special adviser to the party. Lennon is a hate-monger, far-right YouTube personality and founder of the once-rampant „English Defence League“. With his appointment, roughly 24 MEPs for the party have quit, with several former leaders such as Nigel Farage also going. It’s of course cynical on their part: leaving on the premise that the party has become too extreme when in reality, they helped to actively build that extremism. However, it also shows that the more politically-savvy members of the far-right, such as Farage, are clever enough to continue to conceal their true political colours. 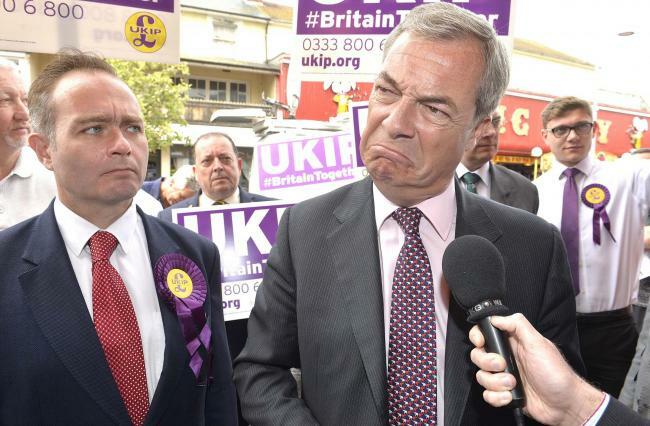 Parties like UKIP, once they’ve had their moment of ecstasy, have nowhere to go except into more hate. And as they do, they will become more marginal. However, this also means politicians like Nigel Farage will bring more extreme views into the mainstream with them. Nevertheless, there is something to do about this: join left-wing parties and causes that create long-term policies and solutions to problems. People will hold on to the long-term and real programmes longer than they will hate.